Fill the form below and we'll get back to you in minutes. Are you Fed up struggling with a system, which seems to add to your workload, which doesn't work the way your school does? Do you want a scalable computerized system with plenty of time saving features that help to get jobs done accurately and quickly? Do you want professional-looking reports and correspondence? .........Then look at Our School Management System. Our 'SMS' is a flexible and fully functional SW that can effectively automate administration processes such as Student Enquiry, Admission, staff, fees, Stock, library and their respective reports of schools, colleges, and Institutions. SMS is Very easy to operate and implement. We ensure proper training of users of the systems and post-development supports. Create different users and assign them permissions to operate various modules of the software. Complete enquiry management that manage and keep tracks from first time enquiry to follow ups to Admission conversion. Student registration with his personal, Academic, Parental and siblings information with the option to upload his photo, Signature and TC. Automatic generation of TC and CC of any student. Fee management could never be easier. Just decide your fees plan, define different Fee heads with their Recursion period like (Monthly, Quarterly, Half Yearly, Yearly etc.) and you are good to go!. Report on Due fee of students can be taken anytime. Manage Staff joining details and their daily attendance. Keep track of all the office in inventories and manage their quantity. Management of school library books by keeping track of their issue and return to the students. All the above modules come with their respective detailed reports. • User friendly UI even a layman can operate the software. • Highly secured with User management. • SMS integration that make sure students/parents receive messages for all the updates and information from the school. 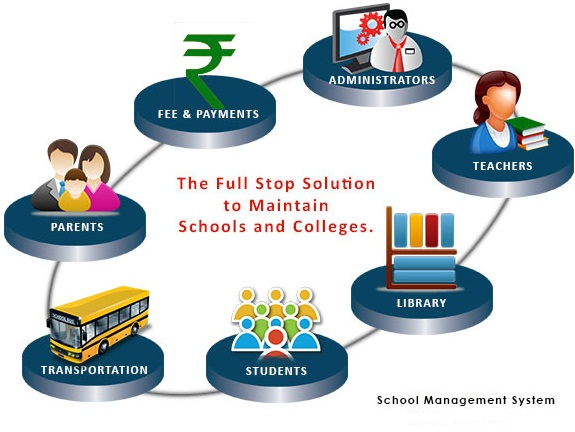 • Window Based Multi School Management software. • Export Any Report into any Format e.g. PDF, HTML, Excel, Word.